Some of my earliest memories involve my mom and dad with our animals. My moms' love was her cattle. She had developed one of the top producing Holstein herds in Quebec, then when we moved out west she worked her way into having a small top quality herd of commercial Herefords, and futher developed another interest - rocks, gems, & stones. My dad's love was horses, the Morgan specifically, and he purchased Silvers Award (Trophy's Award x Jane Wood) as a 4 yr old. Silver was the beginning of Beattiedale Morgans, and as Silver was only a month older then I, we grew up together. I caught a love from both parents. The love of rocks, fossils, & gems which my mom helped to develop by taking me to Rock & Gem shows, all through Jr. and Sr. High School. I spent a year back-packing through Australia and New Zealand when I was 20/21. I still smile when I think of the outback post masters' face, when I handed him a really heavy box to mail home and he asked "What's in this...rocks?" and I promptly answered 'Yup"! To this day I still pick up the 'pretty ones' when I go for walks! From dad I 'caught' the horse bug with Morgans and Arabians/Morabs being the horses of choice. This is how the farm name Ammolite Acres came about - combining the love of rocks from mom and the love of horses from dad! 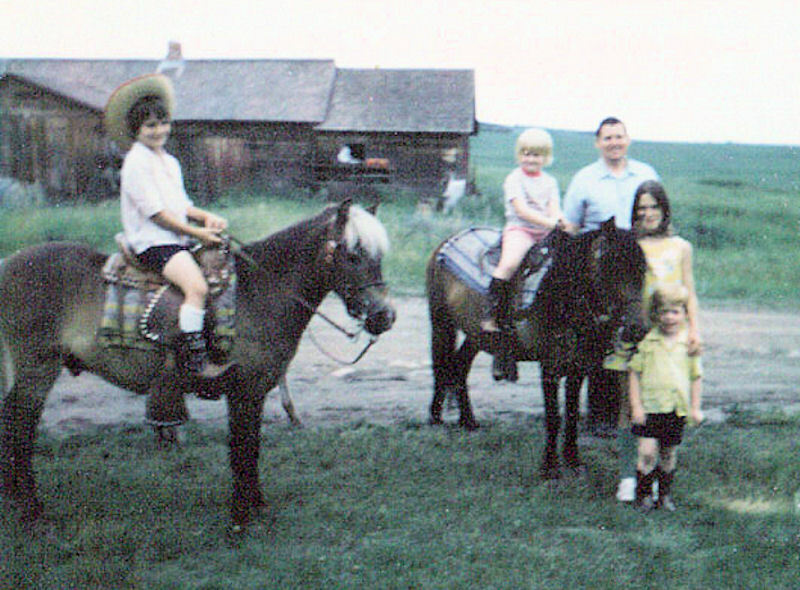 Growing up on a mixed farm in Central Alberta is a truly great life for a kid. I rode from sun up to sun down during school holidays and easily 4 times a week during school, regardless of the weather. When little I had an 11 hh Shetland Welsh cross gelding (Early Autumn) that I rode in parades and fun shows and then drove at home and in the occasional cutter rally as I got older. As I got taller, I moved up to Sunday Surprise a 13:2 hh bay Morgan Welsh cross gelding (by Silver) who had to do it all at 4H shows and Open Shows. Then in about grade 9, I started two mares. Beattiedale Lil Lady, a purebred Morgan mare (by Silver) as a hunter on flat and over fences, and Kelabar a 3/4 Arab 1/4 Saddlebred mare for Western Classes. I was active in the Camrose Light Horse Easy Riders 4H club and will be eternally grateful for all the help the various 4H leaders gave, especially Ben & Dorris Hirsh, who opened up their farm and their hearts every summer, to host a 4H camp where we all had the opportunity to bring our horses, camp in tents, and learn LOTS! I was truly a handful growing up as I was hyper, bad and a geek! I'd rather ride then study, rather bath horses on a Friday night to get ready for a weekend show then go to a bush party with the 'in kids', rather trail ride then party all day/night... so of course this made me stand out from the norm even worse then I already did. This in turn, brought me even closer to my horses as they always understood how I was feeling and helped me deal with it! 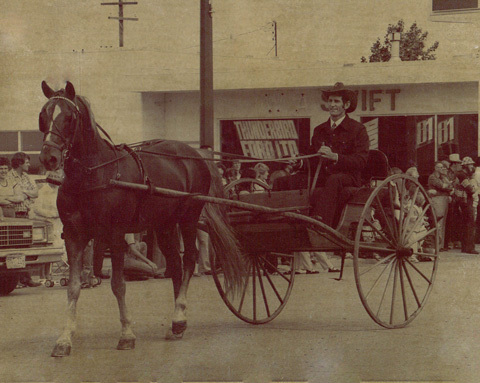 My Dad, Royce Beattie of Beattiedale Morgan Farm, and I participating in the Camrose parade (1978). Note the Breyer Morgan I'm holding. 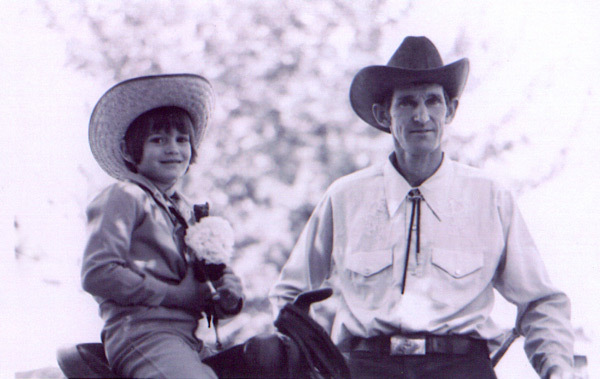 When I graduated and moved from the farm to the city, it wasn't long and I was suffering withdrawal from the horses. I was working at a tack store and found out I could work mornings at the thoroughbred track. So I started work at the track at 5 am, worked till approx. 11 am, then had to 'run fast' to get home, shower, eat, and head to work for my 1 pm to 9 pm shift at the store. When it was time for the horses to ship from Edmonton to Calgary, I chose to move with the horses, so I became a full time groom and pony person on the Alberta A circuit. My boss wasn't sure about "a girl" ponying his race horses, and was horrified when I pulled out my English saddle to pony from...but in 2 1/2 years I only lost one horse, most of the pony people lost from 1 a week to a few a day! I had always wanted to travel, so I decided to go backpacking for a year. In Australia I worked on a dairy farm, as a tour guide assistant, and on a thoroughbred stud where I was lucky enough to work for Kaye, who had finished first in her class at the Irish National Stud and was the most knowledgeable horse person I'd ever met! Then in New Zealand I worked on a dude ranch, taking tourists out for rides in the beautiful countryside, that was a hard job to take (not)! When I returned to Alberta, I went to work for Dave Batty, a top cutting horse trainer and thus got to learn some of the basics of another segment of the horse industry. Then the opportunity to go North and make some decent dollars working a construction job presented itself - so I headed North. At the job end party I met Royce, who as it turns out was destined to become my husband. We lived in Fort McMurray for 14 years, opened and ran a very successful business and then tragically lost both Joe (Royces' dad) and my dad within approx. a year of each other, to cancer. This was a real wake up call for us, and we realized that working 7 days a week running a business and being at the mercy of the customer, was not how we wanted to spend the rest of our lives! So we went property shopping and found our farm - 104 acres of hay with a 2 year old log home in 2004. Since then we have been working hard to build it up to the horse property I believe it can be, my husband has said... "I can't believe we worked that hard, to retire early, to work this hard!" To me the farm work is different though, we work when we want, doing what we want & only at the mercy of the weather! My husband & I are now separated and he is living back in the city, while I've chosen to stay on the farm with my horses & dogs. I guess the old adage is true - once a farm girl, always a farm girl! I love the peace & quiet of the farm, the fresh air, sitting on the deck watching the sunrises and sunsets and watching the foals play in the sunshine - to me - this is life! This page is in honor of my mom and dad. Without your guidance and love as I grew up, I'd be nothing now! And in loving memory of Silvers Award and the horses of my childhood and teenage years, I never could have survived those teen years without you!